Free ad supported version of a $4.95 commercial app. 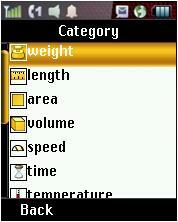 Converter Pro converts between over 220 different units of measures of weight (pounds, ounces, grams, etc), length, area, volume, speed, time, temperature, angles, computer (bits, bytes, KB, MB), and number bases (binary, octal, decimal, hexadecimal). It also allows you to add you own custom conversions. Fast and easy to use. All keys mapped correctly. Everything I tried worked except for converting to/from hexadecimal which was buggy. There was no way to enter the hexadecimal values A through F and conversions to hex where the answer included one of those letters failed. The Converter won’t work if you use numbers in place of letters or vice versa. What does black cobra have to do with Converter Pro? How can i download the all apps i needed?? Installed Converter Pro and gave it permission to download ads. “Ads” listed three “ladies” allegedly wanting to call me. Ignored ads (sic) and immediately uninstalled Converter Pro.